At a Melbourne Writer’s festival panel in 2013, author Carrie Tiffany disclosed that her first novel, Everyman’s Rules for Scientific Living, had been rejected by ‘many Australian publishers’. This book picked up The Victorian Premier’s Unpublished Manuscript Award, launching Tiffany’s career as a novelist. Same early-rejections-then-won-a-prize story with Graeme Simsion’s internationally bestselling The Rosie Project. Other unpublished manuscript awards have recently brought us Favel Parrett’s Past The Shallows, Ellen van Neerven’s Heat & Light, Christine Piper’s After Darkness, Oliver Mol’s Lion Attack and many other titles. There’s a wide reading palate here. Something for every reader to love. And probably also a book here for every reader not to love. Such is the nature of reading. These unpublished manuscript awards pluck emerging writers from relative obscurity, turn the heads of publishers, launch literary careers with fanfare. In the acknowledgements of Foreign Soil, I credit Francesca Rendle-Short, Sam Twyford-Moore and Paddy O’Reilly, the judges of the Victorian Premiers Award for an unpublished manuscript: who in selecting Foreign Soil, made the bravest of decisions where others may well not have. This acknowledgement was carefully and painstakingly worded: what Indyk said recently in his Sydney Review of Books article about the commercial element of literary prizes is true, at least in part. Nobody wants a book or manuscript to win a prize and not be published or sell well. It isn’t good for anyone in the industry – publishers, booksellers, writers, judges, readers – least of all the profile of the prize itself. I felt that in selecting a work not as easily accessible as the other shortlisted entries, written in patois, broken English and many different vernaculars, with challenging subject matter and primarily black characters, the judges had paid little regard to the commercial viability of Foreign Soil. This was an often-cited reason publishers, both explicitly and by implication, had given for rejecting the book. Indeed, at a recent writing conference, an Australian publisher from an independent publishing house boldly declared that diverse literature simply ‘doesn’t sell’ in Australia. The judges of this first award were not diverse in a cultural sense, but in terms of their openness to content and form: one is a master of short fiction, another has a strong interest in hybrid forms, the third is well known for diverse reading tastes and an interest in exciting new writing. There’s been an outcry that Giramondo publisher Ivor Indyk was taking aim at ‘women’s writing’ when he used the term middlebrow recently in Sydney Review of Books to describe the kind of Australian work being awarded prizes. Some have pointed out that this the term has been used for decades to denigrate writing by women. But I’m not so sure this assessment of intent holds. Given Giramondo’s list, Indyk could just as easily have meant: structurally linguistically and thematically accessible. Sure of genre. Safe. Not overtly confronting or politically engaged. Comfortable and palatable in subject matter. Essentially, writing that is easily marketable to the reading masses. Books your average reader on the street would have no qualms devouring on their lunchbreak. Which doesn’t automatically mean a book contains bad writing, or is not literary or prize-worthy. It also doesn’t automatically mean the book is written by a woman. But we should indeed be alarmed if, in 2015, the vast majority of books winning our major literary prizes happen to tick all these boxes. We are told time and again – often by white female commentators – that women are more likely to write this kind of literature, and to write what’s been pigeonholed as ‘domestic fiction’ (which is not necessarily the same thing). We are told that to rail against this kind of work is to fundamentally disadvantage women writers. Black women write differently from white women. This is the most marked difference of all those combinations of black and white, male and female. It is not so much that women write differently from men, but that black women write differently than white women. And we haven’t even started talking about queer literature, or the kind of work being written by women with disabilities in this country. My God, so many intersectionality conversations Australian literature has not even started to have! There are certain questions we should perhaps be asking of our literary prizes. How is an award treasured as our ‘most prestigious’ literary award renowned for its mostly conservative shortlists? How can our major prize for the best book written by a woman in Australia have so far only been won by white, tertiary-educated women with academic backgrounds, whose (albeit very excellent) work is largely concerned – in character and ambit – with white Australia? Why isn’t there not a major book award for queer writing? How is it possible that in the same year the Sydney Morning Herald shortlisted five writers of colour as their Young Novelists of the Year, one state premier’s literary award gave lucrative awards across three or four categories to white writers whose work either heavily relied on multicultural Australia or told the stories of real or imagined people of colour in favour of works written by writers of colour? Of course, it is taboo to even ask these questions. It is whinging. Vindictive. Destructive. And in my case, no doubt, it will be pegged as ungrateful. But when we do discuss these issues, it is not difficult to see the sense in Indyk’s call for literary prize funds to be redistributed where they’re most needed to help those whose voices are the most unheard, who work within genres that are less readily supported or marketable or who are considered, themselves, unmarketable. After all, the combined prize pot is large, and we are so very many hungry. By their very nature, prizes make champions of the few, and leave the disappointed many covetous. I have been blessed enough to have seen and been both. No prize-list will make every commentator content – yet I am evidence that literary prizes can be absolutely career-making. I do not think they should be abolished. I do think that if we are going to attach vast funds to them, these questions need to be asked. We need to be able to dissect these things, as a writing community. To air these truths, and grievances. It makes our literary prize culture robust, and keeps prize panels accountable. Writers – particularly those most marginalised among us – don’t speak more openly about these things because voicing our concerns makes us fear for our future prize prospects, or more immediately, for our reputations and livelihood. On the question of whether prizes help writers or publishers financially, I can only speak to my own experience, which I acknowledge may not be typical. Foreign Soil was put out by a large publisher with a decent marketing budget. It was well-reviewed. Festivals booked me. Readers passed on word to their friends. The book sold about 3,000 copies between May and December 2014. For any literary fiction debut in Australia, that’s a decent effort. For the book Foreign Soil is, it was nothing short of extraordinary. Debut short fiction collections in Australia generally sell around 1200 copies – and that’s considered doing very well. By the end of 2014, sales had flat-lined. I counted my blessings, dusted off my hands, and started working on my next book. Then prize season arrived. There was no money attached to the post-publication prizes the book picked up, but each time the book showed up on a shortlist there was a new round of publicity. Each time there was a new round of publicity, sales figures rose. Each time the sales rose, the word of mouth would also increase. To date, sales have grown to more than 6500. This is by no means a living, especially for a book which took a good five years to write, but other things also came of the increased visibility the prize-lists brought: a UK, and more recently a US, publishing deal; some small grant success where there had previously been none; increased offers of teaching and writing work. Indyk also asserts that prize culture should be measured by the way it treats poetry. As the author of three poetry collections, I have often lamented that, in terms of prize recognition, poetry often gets shafted. Ineligible for the larger prizes, and the hardest sell to boot, poets get a raw deal. Especially female poets. Especially poets of colour (see Omar Sakr’s article below). Part of this, as Indyk points out, is the commercial aspect. Three weeks after Jennifer Maiden’s poetry collection Liquid Nitrogen won the $125 000 Victorian Prize for Literature, I wandered into a Melbourne bookstore and saw it on prominent display at the front of the store. In an ideal literary prize climate, no genre is disadvantaged. In an ideal literary prize climate, there is always a diverse judging panel. An ideal literary prize climate acknowledges where privilege or bias exists, and interrogates it. In an ideal literary climate, conversations like the one Indyk has started give birth to robust, hearty and constructive reflection. Maxine Beneba Clarke is an Australian author and slam poet of Afro- Caribbean descent. Her short fiction collection Foreign Soil won the 2015 ABIA Award for Best Literary Fiction and the 2015 Indie Award for Best Debut Fiction, and was shortlisted for the Stella Prize. Her memoir, The Hate Race, her poetry collection Carrying the World, and her first children’s book, The Patchwork Bike, will be published by Hachette in late 2016. Thanks for this Maxine. I’m interested in this idea of transparency that you and Omar mentioned. At Overland, we judge our prizes blind and publish a judge’s report that generally focuses on what the judges liked about the winning pieces. But I’m interested in what else you think transparency might look like, both for publications like ours, but also for the bigger prizes? I think (as your comment implies) that what’s missing from (that part of) the judges’ discussion that is made public is the reasons for eliminating works that don’t make the cut. Well we do offer that sometimes too, depending on the judges involved (e.g. ‘Structure was a common issue. Some stories had a good premise, but no axis of conflict; others were beautifully dressed, but with nowhere to go. A short story doesn’t have to have a neat ending, but it should turn – it should show readers the moment something changes.’ https://overland.org.au/previous-issues/issue-209/short-story-prize-jennifer-mills/). Dunno, would still like a more concrete discussion about what this transparency might look like and entail. I think Peter Kenneally’s article here on Overland addressed the problem with blind judging very well – everyone has their own unconscious prejudices and as such, even if the process is “blind”, what you’re going to see replicated in the list of winners is the kind of writing the judge has been reading their whole life. And given the huge disparity in representation across the board in literature, that’s predominantly writing that conforms to a certain white Western aesthetic. This, of course, will not always be true and the more well read the judge, the better. However, as Peter notes, with no non-white winners in Canada for the past two decades and only two here out of the past 120, there is a clear and sustained issue here. So what I want to see are more diverse judges across a whole range of spectrums, not just ethnicity, but also sexuality and gender. What does that mean in terms of transparency? It means an open dialogue about who you’re choosing to preside over the prize and why. What did the list of candidates look like? Also, how many poets & writers of colour even entered the competition? Maybe we’re way off base and there just aren’t that many even in the field–though I highly doubt that’s the case, transparency of the kind Sherman Alexie recently offered gives us a better understanding of the forces at work and how they shaped the end result. Sorry for the brevity of the reply but I’m at work and writing on my phone! Happy to talk further about this at any point. How blind is blind? The shortlist is published a week or two beforehand, yes, for anyone to see? Is the judge kept in the dark about that somehow? Hi Omar, thanks for that. There are a number of ideas there, and some assumptions I don’t agree with, but I’ll try and address your main points. I’ll start with the easiest: at Overland, both the shortlist and the winner are picked at the same time – but we announce the shortlist first, in order to give those shortlisted writers some attention for their work. Clearly, the range of differences people can have – from aesthetic preferences to ethnicity, sexuality etc – can’t be captured in any one panel of judges, which is why we now have a policy of changing our judges every prize/year. For the competition that just closed, the judges were Nam Le, Natalie Kon-yu and myself (representing Overland). The currently open Neilma Sidney Prize is being judged by Alice Pung, Maxine Beneba Clarke and Stephanie Convery. At Overland, we believe that only publishing or preferencing one kind of writing is bad for us, and bad for Australian culture more generally. Having a wide range of fiction readers (and, soon, poetry readers) helps us avoid that, as does pushing ourselves with more experimental projects, such as our online poetry editions of spoken word and electronic poetry. But I’m very uncomfortable with the idea of demanding bios of judges that require them to list all the different ways that they are othered, because this reinforces the ways that discrimination occurs in people’s lives. So I think asking for transparency is more complicated than it may first appear. And one more thing on the more detailed judging reports: we would have to pay the judges, who are usually overstretched writers, to write in-depth reports about their selection process, which would require an increase in entry fees, or a decrease in something else Overland does. Hmm I’m not sure if ‘demanding’ bios from judges would be considered as reinforcing discrimination. For what it’s worth, I (and a lot of others I know/read) use our identity markers as descriptors accompanying the work that we do—not only as a form of creating solidarity with people from similar backgrounds, to inform others that our lived experience plays a part in our work, but most importantly, also to make a point that it is not (yet?) a level playing field in which everyone can be subsumed under one category as writers and artists. Based on that logic, identity is fixed, and people who are POC or queer (for example) must include it in their bios, or … they’re not recognised as such? I actually know many writers who don’t include such descriptors. I am also curious where the descriptor line ends, then: if you have a mental illness, if you grew up in housing commission flats, if you went to a private school – these must all be included in your bios? It might be useful to make a distinction between ‘transparency’ and ‘governance’. Ensuring that there is a diverse judging panel, that there is a clearly publicly-stated timeline for the judging, that all entrants are advised promptly if they don’t make the shortlist, that promises of publication are followed through, etc etc is just basic good governance. And it is amazing how many competitions don’t follow these fairly mundane principles. Jacinda quotes an Overland judge who wrote in her report: ‘A short story doesn’t have to have a neat ending, but it should turn’. That’s a big ‘should’, and it’s a statement of preference disguised as an absolute. In his comment about being a judge, Benjamin Solah makes another couple of alarming statements that show pretty definitively that transparency is not at work but anxiety and prejudice is. Indyk’s article looks pretty feeble to me, and indicative of how politically impoverished Australian literature – and publishing – has become. Things are at a pretty pass really. You nailed it mate! Agree 100%. The Shaun Micallef of books ??? Great article. Yes if you speak up you are punished by the gatekeepers. Best to shut up. having been involved in selecting (unpublished) writing for collections and prizes for a number of years, I’d like to know how diverse the actual submission pool is, information we can’t always gather. Perhaps it’s not the judging that’s the full issue but the reach we have as coordinators of these things. Hi Zoe, you’re right, the pool is small because when you come from a marginalised background, you have to jump over so many more hurdles and many really talented writers just give up because it is too hard, especially when, most of the people who run the prizes and the festival are white, and the prizes are awarded to people who they think represents excellence which is traditional, academic white writing. And now we are seeing a serge of white writers getting prizes for writing about multicultural issues! Why? Because they writer the proper way. What people like you and others who have these positions of power need to understand, is that we, marginalised writers, are NEVER going to sound like you. But that doesn’t make our writing of less quality. That perception needs to shift OR get in some more judges who represent US instead of keeping the pie all for yourselves. Loved this article. I think it’s quite the same with language- people who are marginalized or not given, due to their identity, a platform in writing or speech happens reinforce the same power dynamic at play. It is as though discourse and hierarchal capitalist/patriarchal norms depend on each other: rather than concentrating on style and content etc, I wonder if it is really possible to subvert or transgress the synonymous relationship using words that have built our culture as it stands? I think when talking about culturally diverse, we need to also discuss class and maybe the cultural cringe to people who express themselves in less literary more working class/lower class ways, and I think that also then includes other forms, especially race. Secondly, the issue with blind judging became apparent to me when me and Maxine (and Amanda) were judging a prize in which it became apparent one of the poems was written in an indigenous voice someone who might not be indigenous, and we had to unblind the name to myself to make sure. Seriously? You had to ‘unblind’ an entry because of your gut feeling. Because you thought somebody was ‘impersonating’ indigenous person. That’s not how you’re suppose to judge. That is just WRONG. The panel’s experience is exactly why diverse panels are important. We harboured concerns about the authenticity of one work. There were many works submitted which were written in the voices, and from the perspectives, of people of colour, but only this one poem caused an issue. The poem demonstrated some merit, but the voice, vernacular and various other details were concerning. Of particular sensitivity, it was written in the first person voice of a mentally ill incarcerated Indigenous man who’d experienced police brutality. There was no Indigenous judge on the panel. One of the judges consulted an experienced Indigenous author. It was agreed that the establishment of authenticity was critical. In the meantime, the non-Indigenous author of the poem contacted the organisers expressing their extreme discomfort at what they’d written and submitted. The author then requested their own work be withdrawn from the competition. That is definition of prejudice right there! Your job as a judge is not to ‘harbour concerns about the authenticity’ of someone’s work. Your job is to read it blind and to judge it on its merit. I seriously doubt that any competition has a guideline that says that writers are not allowed to write from other culture’s POV. If I were operating on your principle you outlined above I would have never read (for example) Richard Flanagan’s “The Sound of One Hand Clapping”. This is a book about Slovenian immigrants and Flanagan is no Slovenian but he did a great job in that book with non-Aussie (whatever that might mean) characters. Flanagan being an Aussie – did anyone ask if his (Slovenian) voice is authentic? No because it is a work of art and anyone can do whatever they want in art. This non-Indigenous author wasn’t hiding the fact that she/he is non-Indigenous author. Why not judge him or her on the merit of their art? Does this mean Chloe Hooper was wrong to write ‘The Tall Man: Death and Life on Palm Island’? Did publishers thought that the ‘the establishment of (her) authenticity was critical’. In my view your position and the position of other two judges are just wrong. There’s no excuse. 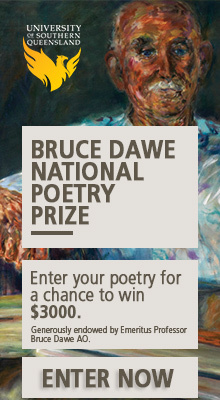 Re: “judging a prize in which it became apparent one of the poems was written in an indigenous voice”. Oh really? And what, precisely, is ‘an Indigenous voice’? What, exactly “became apparent”? And having unblinded the entry did you expect to find an ‘Indigenous’ name like King Billy Whatisname or Jacky Jacky Two Bob? It’s deeply troubling that people, literary judges, could think this way. Can you also identify a non-Indigenous voice? A disabled voice? A queer voice? A mentally ill voice? A bartender’s voice? A lawyer’s voice? A copper’s voice? Is there a guide book on the subject, a ready reckoner of othering taxonomies?? You see where this is going. I’ll leave it there. Better luck next time. is problematic because what IS a “lower class” way of expressing oneself? It is to those who have been most disempowered in society that we owe all our current liberties (in decline, sure): surely there are ways of subverting this very generalized and pseudo-feudal distinction: street art, burning bodies; if you’ve seen Ken Loach’s the Wind That Shakes the Barley, see how estranged you feel from dialogue. Is it language or culture that mediates expression? I think Benjamin means “lower class” in how it is viewed traditionally in society, i.e. speech patterns, sentence structure, language use, etc. It is realistic to accept that certain demographics express themselves in ways that deviate from what is considered ‘correct’ and ‘proper’ (a.k.a. “middle-class” and above) whether as a result of English as a second/third language or due to lack of access to formal education. There is still a lot of cultural cringe when it comes to writing expressed in these styles (whether in ‘broken’ English, pidgin, ocker, etc) that permeates the writing world and I am also of the belief that this needs to be discussed. What are we cringing from exactly? I’m cringing at Benjamin’s comment, regardless of what he might mean by ‘lower class’. Given that someone decided Benjamin deserves to be in a position to be judging something (whatever it is/was), you might expect a more intelligent approach to notions of class and race (not to mention how such things play out in textual production and the reception of texts). Perhaps by lower class he means someone like Alan Jones. I could rest easy with that. One thing is clear to me – there’s no such thing as blind reading of the competition entries. It appears that judges can assume something and in order to satisfy their ‘curiosity’ they can just ‘unblind’ an entry. Benjamin effectively admitted that three judges (Maxine, Amanda and himself) broke the rules of the competition! Now we would like to know which competition was that? If we’re gonna have personal gripes in respect of social impoverishment, associating hunger and writers is a hyperbolic stretch to begin with, and I would question the term race as being a useful social and cultural designator as well, not that ethnicity is much better. Words fail all of us, as they fail social realities. Perhaps addressing those sorts of lacunae are or should be the role of all writers? Well well. terrible terrible, Mr Solah. Just goes to show what hacks there are in our so-called literary world of Australia. Damn there is some real bile being dredged up here. Good discussion between Omar and Jacinda though. I am guilty of judging stories on more than mere merit, but then again being ‘blind’ isn’t part of it. BTW ‘A short story doesn’t have to have a neat ending, but it should turn’ is pretty otm, don’t diss. I’ve been told by administrators of grants that the ONLY reason I missed out on money was due to ‘diversity reasons’. I have listened to a barrage of praise from assessors regarding all aspects of my writing and proposal. Not a single bit of negative feedback. But I am incredibly inescapably WHITE. I agree – judges should have the guts to select and assess work on its merits, not whether it accurately represents the author’s experience. Are you going to disqualify the next YA author who turns out to not actually be a foppish vampire? My writing has been picked up and shortlisted a few times, and every single time the judge or selector has been surprised that I am a woman. Apparently I write like a man. I also write about men – usually poor, young, damaged and hopeful, described in my voice and theirs. I’m not sure how this fits into the neat cartography of ‘intersectionalities’ described above, but I’m feeling pretty dark about this conversation so far. It appears the reputation (if they ever had any to begin with) of these three judges has been permanently tarnished. The prejudice of this fellow Solah (a white be to be sure) is astounding. This is perfect example of ‘damonsplaining’ – white entitled person judging what an Indigenous voice is. And further example that Overland does not care about what other minorities have to say as I am sure this comment will not get published. Good luck Overland I won’t be renewing my subscription! Keep giving voice to Solah and and his ilk (judges who unblind entries). This piece shoulda been called “So Many Very ANGRY Writers”. Who wouldn’t be angry? Have you seen the world lately? Having read the comments to this article, I feel the need to ask: have you ever noticed how these questions of “merit” tend to arise most of all when concerning writers from minority backgrounds? Often it has the air of an accusation – did that writer from that minority background or backgrounds win “on merit”? Bu let’s remember that the business of awarding literary prizes and indeed the whole area of literary production has never been a meritocracy and, moreover, our ideas of “merit” are utterly influenced by our cultural conditioning and biases. We need to dispense with this fantasy of some kind of pristine, culturally-neutral idea of merit.